Two historical sites within close proximity have been treated to a combination of restoration and new-build done with microsurgical precision. 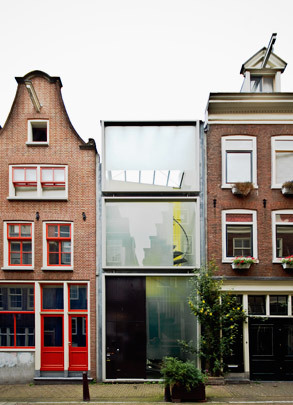 The intervention on Binnen Wieringerstraat concerns a tiny monument of a building expanded with an all-glass stairwell to the street and living space behind. Three rented social housing units could be achieved here by spreading each level across the two plots. The site on Haarlemmerstraat likewise consists of old and new in combination and is characterized by a brazen double-height penthouse perched atop the new portion. See also Studio House Blokland.